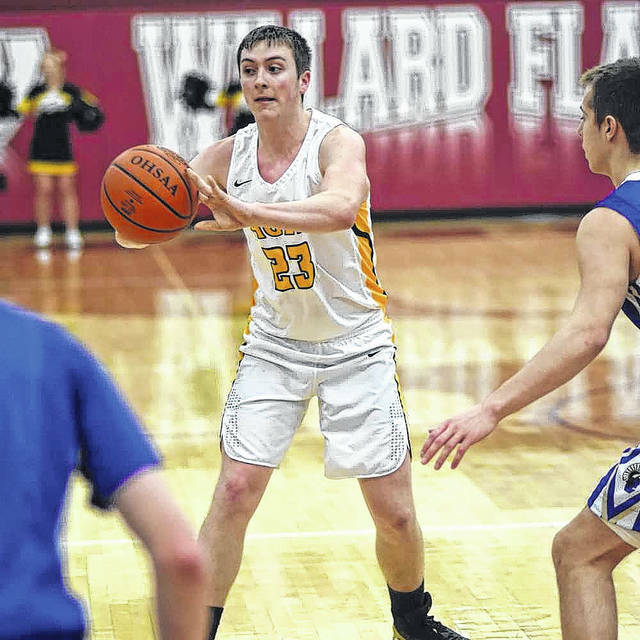 Don Tudor | Galion Inquirer Colonel Crawford senior Brody Martin played in his final game for the Eagles on Friday, March 9. Martin scored 11 points for the black and gold but the squad came up short in the district finals game to the St. Peter's Spartans; 54-49. 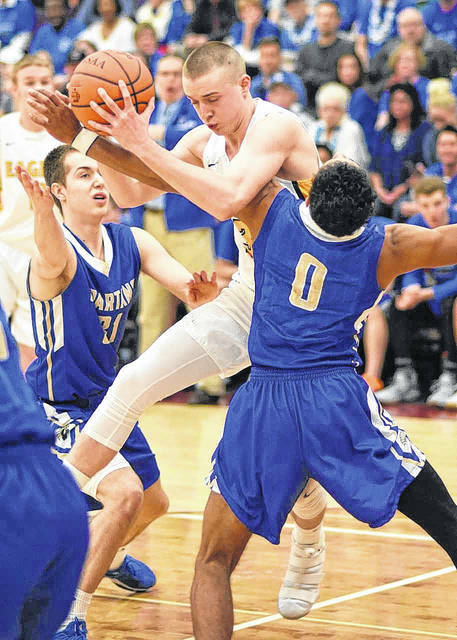 Don Tudor | Galion Inquirer Eagles senior Harley Shaum's high school hoops days are over as Colonel Crawford was ousted from the tourney by St. Peter's on Friday; 54-49. Don Tudor | Galion Inquirer Colonel Crawford senior Hayden Bute looks to dish the ball off during Friday's district finals game against the St. Peter's Spartans. The top-ranked Spartans held on for the victory to advance to the Sweet 16; 54-49. WILLARD — The Spartans are still perfect. In one of the most anticipated tournament games in the area, Mansfield St. Peter’s beat Colonel Crawford 54-49 Friday in a Division IV district championship game. The Spartans are 26-0 and headed to the regional tournament to take on 19-7 East Canton at the Canton Fieldhouse. For the Eagles, their season comes to an abrupt halt at 20-5. Brody Martin, Harley Shaum and Hayden Bute all played in their final game for Coach Dave Sheldon and the black and gold. “Those seniors averaged 17 wins a season over three years,” Sheldon said. “They earned three sectional titles, two district runner-ups and won 20 games in their final season. “(Hayden) Bute was the total team player and would do whatever you asked of him … role player, great kid in the locker room. “Harley Shaum is one of the best athletes that we’ve coached. What a great year he had! “Brody Martin? what a tournament run he had! Martin is the epitome of what the weight room does. He lived in that weight room in the off season and got stronger and was able to do so much more and hopefully our young kids learn a lot from those three young men. “All three of them are special to our program and a big part of our success over the last few years,” an emotional Sheldon said. Sophomore duo Cameron McCreary and Jordan Fenner would finish as the two top scorers for the Eagles. McCreary had zero points at halftime and would wrap the contest with 22 points. Fenner added just two points in the second half to finish with a dozen. In his final game, Brody Martin finished with 11 points. Things got off to a rocky yet promising start for the underdog Eagles, but after the opening eight minutes, the two teams were knotted at 11 points apiece. Keeping with the low-scoring trend, neither team would reach double-digit scoring in the second as the Spartans took a 20-17 lead into the locker room at the half. Fenner and the Spartans’ Jared Jakubick would lead the way for their respective teams with 10 points apiece at the intermission. In the third quarter, Colonel Crawford outscore St. Pete’s and trailed by just two points starting the fourth quarter. Both teams’ offenses of both teams came alive in the final frame, with the Eagles doing their damage from the field while dribble penetration and Crawford’s desperation helped the Spartans earn numerous trips to the free-throw stripe … and the victory. Other stats for Colonel Crawford were: Team- 10/16 from the interior, 7/24 from the perimeter, 8/11 at the free-throw line, 26 total rebounds (9O, 17D), 2 steals, 1 assist, 1 block and 10 turnovers; McCreary- 3 rebounds, 2 steals; Fenner- 3 rebounds; Martin- 7 rebounds, 1 assist; Harley Shaum- 4 points, 8 rebounds; Reis Walker- 3 rebounds, 1 block and Chase Walker- 1 rebound. 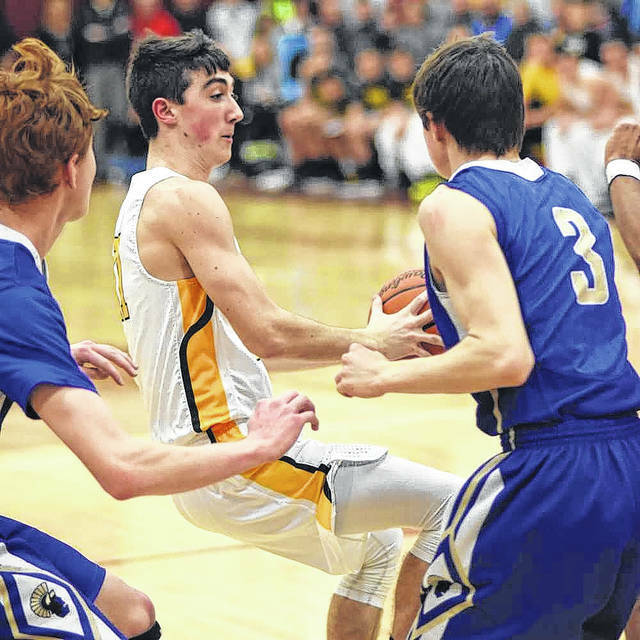 The Eagles committed a total of 22 fouls on the evening. Jakubick finished with 25 points to lead all scorers. He was 12/13 from the free-throw stripe, grabbed seven rebounds, dished two assists and recorded a steal and a block. Elijah Cobb also chimed in with 18 points of his own to go along with six rebounds, an assist and three steals. Other stats for St. Peter’s were: Team- 11/23 from inside, 4/12 from outside, 20/27 from the stripe, 26 total rebounds (7O, 19D), 4 assists, 5 steals, 4 blocks and just 6 turnovers; Caleb Stewart- 6 points, 3 rebounds, 2 blocks, 1 steal; Luke Heinrich- 3 points, 2 rebounds; Jonah Ramey- 2 points, 6 rebounds, 1 block and Eli Gurski- 1 rebound, 1 assist. The Spartans committed just nine fouls throughout the contest. Colonel Crawford senior Brody Martin played in his final game for the Eagles on Friday, March 9. Martin scored 11 points for the black and gold but the squad came up short in the district finals game to the St. Peter’s Spartans; 54-49. Eagles senior Harley Shaum’s high school hoops days are over as Colonel Crawford was ousted from the tourney by St. Peter’s on Friday; 54-49. Colonel Crawford senior Hayden Bute looks to dish the ball off during Friday’s district finals game against the St. Peter’s Spartans. The top-ranked Spartans held on for the victory to advance to the Sweet 16; 54-49.